The ultimate family-friendly Southern Utah getaway is within reach thanks to this lovely vacation rental. Conveniently close to nearby attractions, this rental boasts amenities such as a private hot tub, a shared pool, and a shared 20-person hot tub. Part of the newly constructed Paradise Village at Zion community, this home sits on the outer edge of Santa Clara. The city of St. George is less than 10 miles away, and Zion National Park is a little more than 50 miles to the east. The inside of this sleek and modern vacation rental features soft, sophisticated neutrals paired with bright accent colors. The central living space features oversize couches, a large flatscreen TV, and a dining room table big enough for the whole group to enjoy a meal together. The well-appointed gourmet kitchen features stainless steel appliances, including a dishwasher, so feeding and cleaning up after your crew has never been easier. 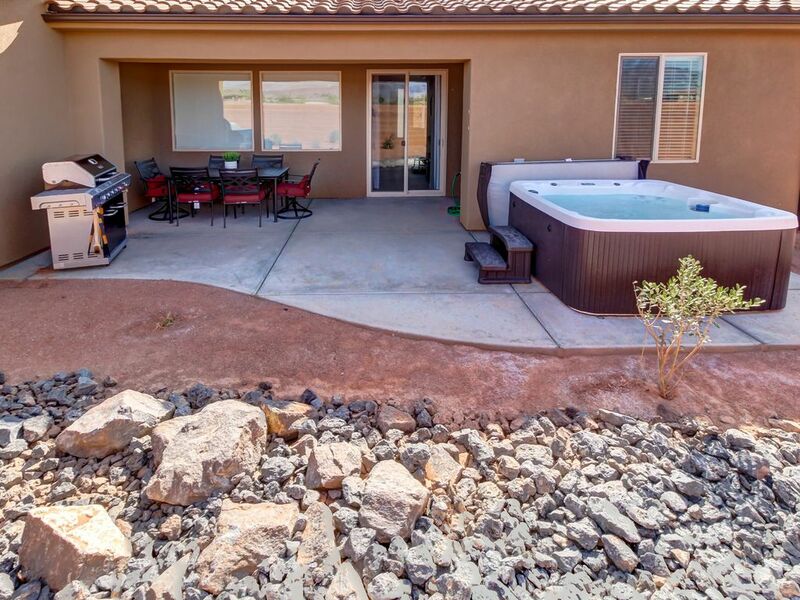 On nice evenings, enjoy your meals outside on the patio, followed by a soak in the private hot tub. This home has room for up to 12 lucky guests. The main floor master suite includes a king bed and an en suite bathroom. On the second floor, find two more bedrooms - one has a king bed and a private balcony, while the other features two sets of twin-over-double bunk beds. A sofabed rounds out the sleeping options. Additional amenities include a private washer and dryer, as well as free wireless internet - all the better to keep your vacation running smoothly. The Paradise Village at Zion community offers a number of resort amenities, including access to a 20-person hot tub and a two-tiered swimming pool. Guests will also find walking paths throughout the property, perfect for a quiet stroll. Spend a day or two at nearby Zion National Park hiking and canyoneering and the Colorado River for whitewater rafting. Cap off the day's adventures with a scenic drive through Zion Canyon. For more leisurely activities, visit Santa Clara or nearby St. George for shopping, dining, museums, and attractions. Whatever you're looking for, you'll find it here. Start planning your Southern Utah adventure today! Thanks for considering a Vacasa home! We provide full-service management for privately owned vacation homes, and like to think that we offer our guests the best of both worlds: the unique experience of staying in a one-of-a-kind vacation home, with the peace of mind that comes from knowing that the home you book for your special vacation is cared for by professional housekeepers and property managers. Vacasa began in 2009, simply because our founder and CEO Eric wanted to find a better way to share his wife’s family’s summer home in Long Beach, Washington with guests as a vacation rental. Eric and his early team worked to build Vacasa on the premise that local employees can do what they love most (taking care of guests, homeowners, and properties), while the hands-off tasks of vacation rental management—things like marketing, filing taxes, and maintaining a website—could be handled by a specialized central support team. Our passion is connecting travelers with the unique experience of staying in a vacation home, and we would be honored to be your host. Please contact us with any questions about this home—our team is standing by! Fanastic! Very comfortable and accommodating! Loved the amenities of the area and the new water park! Kids had a blast with pickleball! We loved being so close to the pool and having the private hot tub out back. It was nice to have space. Our family loved the puzzles and games in the closet too! It was very clean and so cute! Loved the private hot tub! Close to park and grocery store. Bike trails and hiking. Be a great place to come visit again when it's warmer. Granddaughter loved the bunk bed. House had everything we needed.